You're an employee and a student right now. Yes, I am a Masters candidate in Meteorology at Florida International University. I am hoping to have it finished by April of next year (2014). My thesis is very interesting. Three years ago, while I was working on my Bachelor of Science in Meteorology, I began working part time with Dr. Chris Landsea on the Hurricane Reanalysis Project. I started with the 1954 season, then 1941 and 1942. When I completed my Bachelor degree, one of the members of the analysis team here left and I was able to take his full time position. And my Master's thesis will cover the 1955 through 1964 hurricane seasons. That period had a lot of storms with big impacts on the United States and the Caribbean. Did you have an early interest in meteorology, similar to just about everyone else at NHC? Oh yes. My favorite subject has always been science; there is no question about that. I came from a very poor rural area in Cuba in the countryside of the old province of Havana. One of my first experiences with weather was when I was very young and the sugarcane fields had just been cut. It was a hot summer, and I saw a dust-devil. Most people run away from them, but I ran right into it. And Cuba is known for hurricanes. The first storm that gave me interest was Hurricane Georges in 1998 when I was 11 years old. It got close to Havana but went over the next province. I remember listening to the radio and seeing some of the news that the hurricane was approaching and that they were evacuating. But there is not a lot of information in Cuba, certainly not compared to what kids have in the United States. That next year (1999), my family and I were preparing to come to the United States. We had the interview, but were worried about Hurricane Irene. The storm came right over us. Other than damage to the sugar cane crop, it was not too bad. And we got to the U.S. in late November. The change must have been dramatic. It was very different. There's the Internet, a lot more information about hurricanes. My first season was 2000 – a really active season. My godmother saw the enthusiasm that I had, and suggested I contact the weatherman at Univision Channel 23, John Morales. I did, and probably called him almost every day to get some local weather information like the daily low and high temperature and rainfall. I would also talk about the tropical cyclones occurring in the Atlantic and other basins. I'm sure I was a big nuisance. But everything was interesting to me. What is greatest challenge in your work at NHC? The main problem is that lack of data over the entire basin. We are trying to improve the HARDAT record, which is the hurricane database of the north Atlantic basin. When it was first put up in the 1960s and '70s, it was not created for the purpose for which it is used today. Researchers are using it for climate change, legal purposes, building codes – all of which require a good database. The problem, especially for those hurricanes that impacted the United States, is that the intensity that appears in HURDAT was estimated based on the air pressure and not the wind. We know today that doesn't work. But the wind data is not always there. Right! You only have a certain amount of ships and a certain amount of sea routes that the ships will follow. For instance, the central Atlantic, the Caribbean and the southern Gulf of Mexico are all areas without a lot of data. Once reconnaissance aircraft became routine in the '50s, routes were established to go looking for storms. What's the most fun part of the job? I know it sounds tacky, but this job is a dream come true for me. 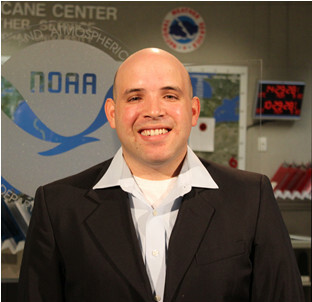 I had dreamed of the time to be able to come to the National Hurricane Center, have a conversation with the specialists. That happens every day now and I don't take that for granted. It is a privilege. You learn by listening to people who know more than you. Once your Masters and the reanalysis, are completed, what's next? Right now, we are in a tough situation in this country. My dream is to one day be a hurricane specialist, and I know that there is an opportunity in TAFB (Tropical Analysis and Forecast Branch). But everything right now is frozen for job hiring. Are you able to turn it all off when you walk out of the building each day? No. I am a weather person 24/7. When I go home, I am still following weather. But there has to be something. I love baseball! I love stats. And baseball is full of it.